Tell us about your group - what is Wolf-PAC's mission? Wolf PAC is a non-partisan grassroots organization that’s 98% volunteer driven. We’re about fighting corruption in the federal government. For us, the root issue right now is campaign finance reform. Pay to play politics should not be how the system functions. It’s pervasive, it’s the stumbling block for every other issue -- climate justice; war; money in politics; this corrupted system basically defines how Congress responds to those issues. We are a group that’s trying change that by amending the constitution. Amend the constitution? How do you plan to do that? We’re using the path of an article 5 limited convention. The constitution essentially gives you two ways to propose an amendment: Congress can do it, which is traditionally how it’s been done, or the states can call on Congress to call a convention for a specific purpose on a specific issue. Our issue is campaign finance reform. We want to deal with the disastrous effects of Supreme Court decisions like Citizens United vs FEC. There are half a dozen others that you could point to, but that’s the most well known. We’re going that route because we consider it the best path right now, it’s part of a greater strategy called the “multi-pronged approach,” if you will. Congress has been unresponsive, so we’re calling on the states to speak out for what the people need to add pressure for this to happen. Only Wolf-PAC is tackling this issue this way. For those reading, what exactly has to happen for an article 5 to happen? You have to have 34 states request Congress call the convention, and for what Wolf-PAC is doing it has to be requests that are specifically related to campaign finance reform. You can’t have some states calling for a convention on one issue, and others on another, for example, Congress won't call the convention if campaign finance has 5 States, and the Popular Vote has 29 calls, there is no mixing and matching. It has to be 34 states calling for campaign finance reform, for Congress to take action on the convention. And to do that you have to have citizen activists and lobbyists. You need to have folks on the ground that know about the issue and know about the constitution and its nuances who go to our legislators and talk about why that change needs to happen. Only 27 amendments have been ratified of the more than 11,000 introduced, so it's a very tough path, which is why we see the convention request as priming Congress for ratification. You’re saying we need this. We need this so badly we’re bringing it up to you, though if you don't do it we will. It’s democracy! It’s the people saying we want, we need it to happen. It’s the way forward when there’s no other way. It’s our safety switch for when the government’s not responsible. And it requires people like you and I, getting active and doing something with our government, engaging with them, and saying we really do need this that moves things along. What is your role at Wolf-PAC? I’m the National Coordinator. I started off volunteering like everybody else. I moved into the role of an organizer; following that I moved into the role of community director for New York; and last year I became a National Coordinator. I provide members with the guidance and resources that they need. I work with four states - New York, Pennsylvania, Oregon, and Arizona. They are in a somewhat similar place legislatively. Is it hard to serve those states remotely? Yes and no. If I were there in person, I’d probably be much more involved in the day to day happenings. Because I can’t be there, I try to help people develop in a way where they have a good support structure, and definable, achievable goals. A movement is not one person, anyway! I or anyone should be able to step away without things falling apart. So we focus on building that support structure which will ultimately be more successful. It’s all about the team, that’s my view. Any recent successes you’d like to share? With New York, I want to say that our team has gotten a lot stronger, and that makes me really proud. We were successful in implementing a new organizational structure that’s far less top-down. It’s given everyone more of a voice. People get to be heard, and I’ve learned that you may think you have the answers, but it’s more likely you have an answer. And the person right next to you might have a better answer. So you want to be able to hear them and make sure they have the chance to speak. This also makes it possible to share more of the responsibilities and different duties. It makes life and organizing easier! Upcoming events? Ways people can get involved with Wolf-PAC? 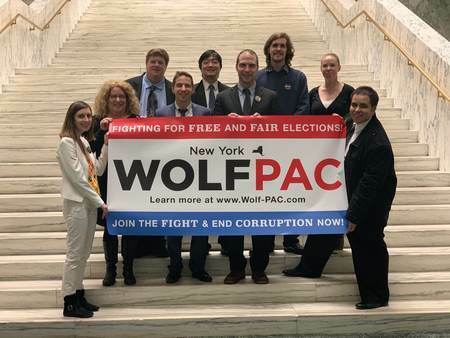 If they’re in New York, head to wolf-pac.com/ny. That brings you to our state page. Otherwise, head to wolf-pac.com. Also follow us on Facebook and Twitter. I tell anyone: anything you want to do to help, it’s always appreciated. Take that first step to volunteer. I really appreciate when people do that. We are here to help you succeed in whatever it is you want to do. You being successful means we can be successful. We don’t turn anyone away. Anyone you’re looking to connect with? Volunteers; anyone who’s interested in really changing the way our government works for the better -- conservative; liberal; middle of the road; whoever you are. This is all of our government! Also those who are opposed to the Article V convention process, because I think we agree on a lot, and can do a lot of good for the country and our state working together. I’m about building bridges and coalitions, bringing people together. This is too important of a problem to disagree about, we can’t let egos and past disagreements hold back the movement. Reflections on your work so far? Thoughts from the field? I want to say that this movement is far more urgent than people realize. If we are to truly get representation in congress - really get the representation we need - we’re going to need an amendment pertaining to campaign finance reform. We can’t wait on congress to change the laws. Whatever laws they do change will be challenged, as they have in the past. And the Supreme Court has historically favored our more corrupt system. If you want to do something about any specific issue, the realization is that those issues are never truly going to get the attention they deserve or the resources that they need. It’s money that stands in the way, then we have to do something about our campaign finance system. And from what I have learned from the research I have done, the article 5 convention is the strongest path forward for the American people. That’s because when congress is not responsive, the states have the option to change things for the people through the convention. And it is without a doubt, a legitimate process. It’s something that we need to do when our government doesn’t respond. Our movement will push things forward. If congress does it before we get to the convention: great! I’ll retire. Or through our website at https://www.wolf-pac.com/ Click any of the links under ‘Take Action’ and we’ll get in touch with you. Want to learn more? Read other profiles!